Single contact self-latching high voltage connector with a test voltage from 5 to 70 kV d.c. The Y series connectors are used for High voltage applications ranging from 5kV to 70kV. These connectors are single pin connectors. 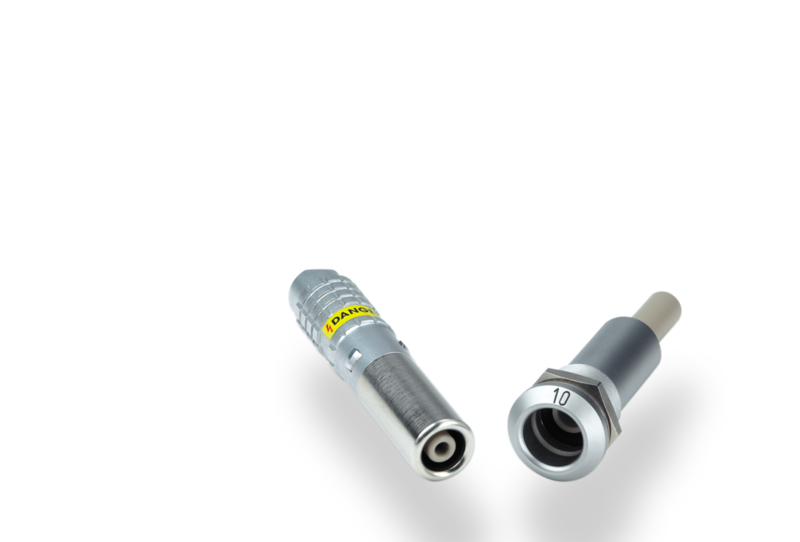 Requirements in the field of nuclear research have given LEMO the opportunity to design a new generation of high voltage unipole connector in the Y series. The use of insulating material such as PEEK and silicone rubber and the connector design allows to offer extended creepage distance and air clearance. For these connectors coaxial and shielded cables can be used in both military and industrial high voltage applications including Radar, ECM systems, power supplies, aerospace, industrial, medical and instrumentation. Many of the recommended cables have controlled impedance. These cables include PE insulation and PVC jacket, other materials such as FEP are also possible. LEMO offers a range of cables that fullfil UL11152. Test voltage from 5 to 70kV d.c.